Shmee Takes A Ride On The Snowpiercer! 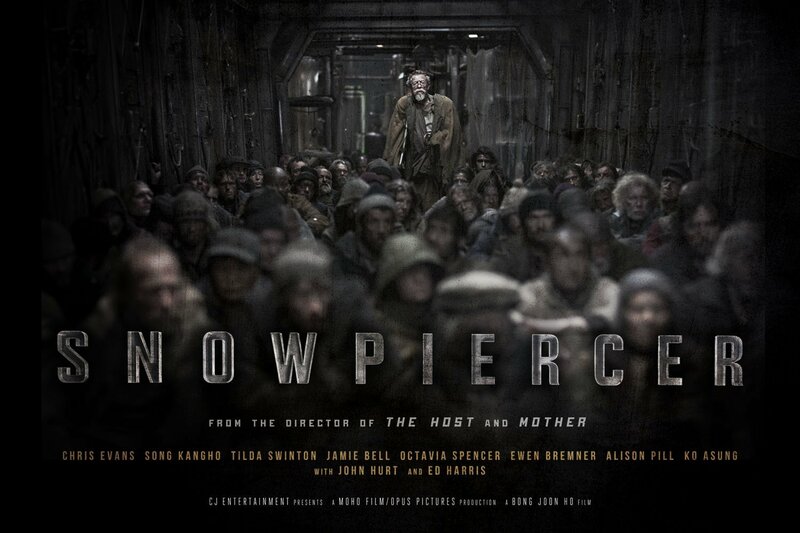 For people that don’t know, Snowpiercer is the Korean made film based on the French graphic novel of the same name. It was directed by Bong Joon-ho, one of the best Korean film makers around. He also directed the excellent movie The Host (the Korean monster movie, not the American YA book adaptation). If you don’t like foreign films, never fear this movie is 80% in English, and it is very easy to follow. Which you should, because it is a great ride. The movie starts out by explaining that the world powers tried to control Global Warming by using artificial means, and instead they caused another Ice Age. 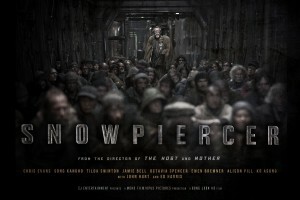 The only people that are alive are on a train that never stops called the Snowpiercer. The people in the back of the train are growing angry about their treatment at the hands of the people in the front, so they start a revolt lead by Curtis Everett (Chris Evans). Now I will grant you that is one far fetched plot, but they do such a good job telling the story that you will not mind. This movie does what the best Sci-Fi films always do, and that is to use crazy ideas and situations to really talk about the here and now. I didn’t always appreciate what this movie was trying to tell me, especially about religion (I think Bong Joon-ho believes in God, but that he is not a big fan), but at least they got their point across well, and in an entertaining way. They got a great cast for this movie. For the first half of this movie Chris Evans is in full Captain America mode, but at the end of this movie he really gets to show his acting chops. He says he wants to retire from acting, but this movie makes me wish that he stick with it. Tilda Swinton once again proves her worth as a character actor as Mason the smarmy front car middle-manager who is in charge of the rear car passengers. John Hurt and Ed Harris bring their great presence to this film, and add depth to their roles even with limited screen time as Curtis’ would be father figures. This movie manages to play the edge between action film and drama very well. Enough action to keep you entertained, and then it does what very few films these days try and do, engages your mind. It also believes you are smart enough to understand it, and that again is a very rare thing. This movie is not perfect. It is a little odd, but considering we don’t get movies like this very often, I will take it. It is a shame this movie didn’t get a bigger push from the The Weinstein Company (they didn’t think you were smart enough to understand it) because I think it could have been a bigger hit. If you get a chance, I think you should book passage on the Snowpiercer. I was really hoping this would get a wide release as well. As it is I’ll probably just watch it through Amazon Instant Video, thanks for the recommendation! That is how I watched it. It was $7 well spent. I was tired of hoping that it would show up at the Pickford on a night that I was free. Previous PostPrevious The Hobbit: The Battle of the Five Armies Trailer is Out!